For the fourth consecutive season, the Troy Trojans and Lyndon Tigers will meet in the Class 2-1A quarterfinals. Lyndon will travel to Troy to take on the top-ranked Trojans on Friday night. Troy has won the past two meetings 23-0 in 2014 and 58-21 last season. Lyndon won 37-8 in 2013. 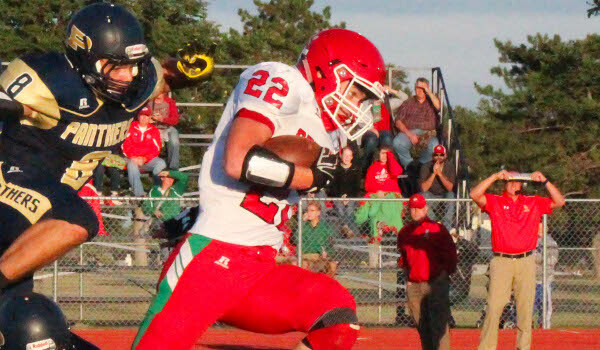 The Tigers rebounded from their Week 9 loss to Olpe by blowing past Oswego, 56-12 in their playoff opener. Lyndon rushed for more than 400 yards in the win led by Dexton Swinehart’s 158 yards and two scores and Mason Slusher’s 112 yards and two touchdowns. Rylan Burns passed for 139 yards and two touchdowns hitting Swinehart five times for 100 yards and a score. Lyndon’s offense typically goes through Swinehart. The junior back/receiver has rushed for 1,413 yards and 18 touchdowns on the season, while catching 34 passes for 631 yards and seven scores. Quarterback Rylan Burns has completed nearly 60 percent of his passes for 1,221 yards and 13 touchdowns. Burns has also added 487 yards and 11 scores. Slusher leads the defense with 94 tackles including six tackles for loss. Swinehart’s added 74 tackles and a pair of interceptions. The Tigers have picked off 12 opponent passes this season and will likely get tested in this game. Troy senior quarterback Reid Greaser has thrown for more than 2,400 yards a season after earning Kpreps All-State honors for passing for 1,800 yards and 25 touchdowns. Greaser’s primary target has been senior Cuttar Huss. Huss is a two-time Kpreps 2-1A All-State selection (2014 & 2015) and has topped the 1,000-yard receiving mark for the first time in his career this season. Brody Winder has added more than 800 yards receiving for the Trojans. In last Friday’s 42-16 win over Valley Heights, Huss rushed for two touchdowns and caught a touchdown pass from Greaser. Alex Martinez led the Trojan ground attack with 159 yards rushing and a touchdown. After falling one point shy of the 2-1A state championship last fall, the Trojans seem motivated to get back to Hays. If Lyndon is to pull off the upset, the Tigers must control ball, limit mistakes, and limit Troy’s big plays. La Crosse delivered a huge win with a 44-29 road victory against Meade in the first round of the playoffs last week. It marked the most points the Buffs had permitted since the 2008 sub-state championship game against Smith Center. The Leopards ran 66 plays for 451 yards, including 327 on the ground. The Leopards average 279 rushing yards a contest. As well, the Leopards, who have struggled with turnovers, finished plus-3 in turnover margin. Friday marked the second time La Crosse has not turned the ball over this season; the Leopards have committed 15 turnovers this year. La Crosse and Republic County became the first 2-1A teams to enter the playoffs with a losing record and win a postseason contest since 2010. Senior quarterback Clayton Herdman and senior fullback Jasey Woods each delivered standout games behind the Leopards’ veteran offensive line, considered the team’s strength. Woods has had his two best games against Ellis and Meade, which are the team’s two best victories after an 0-4 start. Herdman rushed for 137 yards, passed for 124 and accounted for six touchdowns. He and Woods are both four-year starters. This year, Herdman has 969 passing yards and 1,038 rushing with 32 scores accounted for. Woods has tallied 874 yards with five TDs. Third-leading rusher, senior Brad Collins, didn’t play against Meade. La Crosse is up to 6.4 yards per play. Smith Center has won eight straight after an 0-2 start and have the No. 1 defense in the classification with just 93 points allowed. The Redmen average 7.2 yards per play. The major difference between the offenses is the Redmen have just seven turnovers. La Crosse has 15. Junior quarterback Colton Hutchinson took over in Week 1 after an injury to Thayne Benoit and completed 39 of 71 passes for 747 yards with nine scores against four interceptions. Seven running backs have at least 268 yards, though the Redmen doesn’t have a feature back. Standout senior Kaden Meitler hasn’t played since Oct. 14. Junior Dalton Kuhn leads the defense with 13 TFLs. Smith Center is plus-15 in turnover margin. These two have met up in the regular season each of the past two years with La Crosse winning in 2014 and Smith Center last year. It’s the first playoff game in the matchup since the highly-publicized ’08 postseason contest in a 32-14 Smith Center win. The Redmen are 19-5 in its last 24 contests but 0-4 versus Phillipsburg in that span. The lone other loss was a 20-16 road loss to Plainville to open this year. Plainville defeated La Crosse, 46-12, in Week 9. Herdman and Woods were part of ’13 state runner-up squad that defeated a great Oakley team on the road and then Meade at home. As well, La Crosse earned another big win versus Meade in ’14 and again this fall. The Leopards have generally played above their regular season performance in the playoffs. This year, La Crosse has had trouble with very quick running backs, speed that Smith Center doesn’t quite have. La Crosse’s power running is similar to Plainville and Phillipsburg, two teams who moved the ball on the Redmen. The Redmen have certainly had the better season, but the Leopards can win this game if they avoid turnovers and have Woods control drives.